We’d love your help. 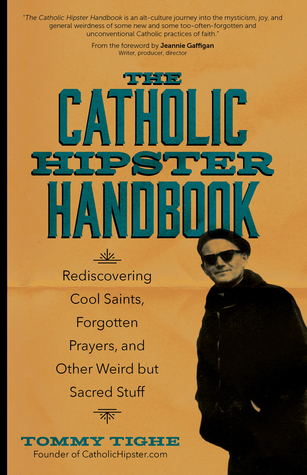 Let us know what’s wrong with this preview of The Catholic Hipster Handbook by Tommy Tighe. Being a Catholic Hipster is all about an attitude—an attitude grounded in being part of a countercultural community of believers dedicated to something bigger than themselves in a world dominated by self-centeredness. It’s about yearning to learn more about the faith by seeking out “Catholic cool”—overlooked saints, forgotten prayers and feast days, and traditional practic Being a Catholic Hipster is all about an attitude—an attitude grounded in being part of a countercultural community of believers dedicated to something bigger than themselves in a world dominated by self-centeredness. It’s about yearning to learn more about the faith by seeking out “Catholic cool”—overlooked saints, forgotten prayers and feast days, and traditional practices long set aside by mainstream believers. 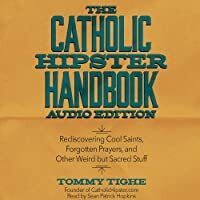 The Catholic Hipster podcaster Tommy Tighe will help readers rediscover everything awesome about the Catholic faith. To ask other readers questions about The Catholic Hipster Handbook, please sign up. I received a free ARC of this book from NetGalley for an unbiased opinion. Let's face it...there's no good way to give a completely unbiased opinion about religion or hipsters. I went into this book with a disgruntled opinion based on childhood experiences regarding those I saw within places of power in the Catholic church abusing their power, and when I think "hipster"...I just cringe. So how did I walk away giving it a four out of five star review? Well, honestly, because it jolted a lot of thin I received a free ARC of this book from NetGalley for an unbiased opinion. 1) It reminded me that what drove me from Catholicism was the actions of a few select people, not the religion as a whole. As the only Christian religion to recognize saints, there's a lot of great people in the religion, too. I loved the stories of the different saints as a child, and this book helped remind me of some of those. 2) Each section of the book includes a "forgotten prayer". Some of them were absolutely beautiful to me and touched things I should be saying to God on a regular basis, even as a Christian who isn't Catholic. 3) Each section also included an activity to further a reader's understanding of the chapter. Some of them were easier to accomplish than others, but it was engaging to follow those along. This book was such a joy. I learned some new (old) things and LOLed several times. I will definitely reread and recommend to others! I have friends that talk about having found their 'tribe' or 'people.' Reading this title has me realizing I AM a Catholic Hipster. And, several of my friends are too. While the cover and title seems a bit carefree, what you will find inside is not. Everything is presented in a manner that has you wanting to dig deeper, especially when it comes to the 'cool' saints. I enjoyed this so much that I was sharing on my FB wall to friends after just the first few chapters. Note ~ I did get a copy from Net I have friends that talk about having found their 'tribe' or 'people.' Reading this title has me realizing I AM a Catholic Hipster. And, several of my friends are too. This book was not exactly what I was expecting. I had seen it mentioned by so many people that I was certain it would be something I would like and purchased it without realizing that it is an anthology with 12 contributors when you included Tommy. Sort of a modern-day group of apostles. And the sections in t This book was not exactly what I was expecting. I had seen it mentioned by so many people that I was certain it would be something I would like and purchased it without realizing that it is an anthology with 12 contributors when you included Tommy. Sort of a modern-day group of apostles. Each chapter follows the same format, the main article, cool saint, forgotten prayer, and activity. When I first started reading this book I could not tell if it was satire, sarcastic, or real devotion. My wife often comments that sarcasm is lost on me so it took me a few chapters to figure it out. In the end I found I really enjoyed the book at took it at face value. I give it a solid 4/5 stars. And it took a few days to settle on that rating. I read fairly widely, and I read a lot, but I was unfamiliar with most of the contributors prior to reading this book. I have started following a few of the contributors on social media because of their contributions to this book. I have known a few Catholic Hipsters, going back to a college and Careers group at Saint Mary's Cathedral in Kingston Ontario in the late 80's and early 90's. Hipsters before being a hipster was cool. What I loved most about this book was that it comments on several trends in the Catholic community today, some that are growing and others with longer standing. I really appreciated the section 'Forgotten Prayer' and also 'Cool Saint' the activity sections are good also. This book comes across for the most part as a fun playful read. It pokes a little fun at certain traditions or practices but not in an irreverent manner. It has some interesting activities to try, either personally or in a group. It would be really intriguing to work through this book with a group of friends and find where it really connects with readers and where it misses the mark. This is an easy read and very accessible. I would say it is even accessible for teens and tweens. So, could be a good study for a youth group. What I loved most were the prayers and saints presented. Overall a very refreshing read, particularly during this time of conflict within the church. So give it a read and figure out where you end up on the hipsters scale or tribes. This is a fun compilation of what exactly makes one a Catholic Hipster. Each 'chapter' is broken into 4 subsections: Random information from the author, a "Cool Saint," a forgotten prayer (typically related to the saint and/or topic), and an activity for the reader. For the authors whose voices I know (radio, podcasts, etc. ), I could even hear them in my head as I read. - Saint Epaphras, whom I didn't think I'd ever heard of, is in the Bible. - Sergio Bermudez's Cathol This is a fun compilation of what exactly makes one a Catholic Hipster. - Sergio Bermudez's Catholic slang made me laugh. I've learned I'm not a Catholic hipster and yet I wouldn't feel out of place among them, standing off to the side and laughing along with the conversations. Do you know about all the coolest Catholic Twitterers, the best Catholic music, the loveliest prayers and the most interesting Catholic blogs? This handbook by Tommy Tighe will help you find all of these! It’s not just a frivolous guide, however. It also contains articles about important Catholic doctrines and history, and it’s worth keeping whether you are a cradle Catholic, a convert or even undecided! I greatly enjoyed it. I am not sure about going to a Tridentine Mass, however. Although it s Do you know about all the coolest Catholic Twitterers, the best Catholic music, the loveliest prayers and the most interesting Catholic blogs? This handbook by Tommy Tighe will help you find all of these! It’s not just a frivolous guide, however. It also contains articles about important Catholic doctrines and history, and it’s worth keeping whether you are a cradle Catholic, a convert or even undecided! I greatly enjoyed it. I am not sure about going to a Tridentine Mass, however. Although it sounds interesting, it’s a hard idea to get used to. This section did remind me that my parents were shocked that the Mass was in Latin until recently, and I liked the thought of going to a service in Latin when I was a child! I especially liked the fact that one of the authors reminded readers that the first duty of a Catholic (and, arguably all Christians) is to give. I received this free ebook from Net Galley in return for an honest review. It may not be a page turner as a whole (although it is within chapters), but that is because each chapter has a unique theme for its essay, and most of them seem to be made especially for us. Some of them can be really thoughtful. Others are more fun. Every and each of them is very informal, filled with life, and a very simples language, easy to understand and to extract some laughs. I just realized that this book is also a prayer book and that each time I read it I would pray, because of the For It may not be a page turner as a whole (although it is within chapters), but that is because each chapter has a unique theme for its essay, and most of them seem to be made especially for us. Some of them can be really thoughtful. Others are more fun. Every and each of them is very informal, filled with life, and a very simples language, easy to understand and to extract some laughs. I just realized that this book is also a prayer book and that each time I read it I would pray, because of the Forgotten Prayers, so, there's that, too. Sometimes I just wish that the chapters would be longer and forward us to other books, movies, or websites, to let us explore more about its theme. I guess this is part of its concept, though. And I can't wait to share its essays with other people, in retreats, in Youth Groups, anything, really, because I think this is made for it, it's very good to introduce or rediscover some weird but sacred stuff! I enjoyed the brevity and variety of these selections as well as the format - topic, cool saint, forgotten prayer, and activity. It made for an easily digestible handbook! Like many collections, this one was a mixed bag. Some contributions I loved, some I learned from, and a couple struck me as condescending/snobby (which I guess shouldn't surprise me if written from a self-identifying hipster ;-)). I listened on audiobook, and while the narration was good, I think I would've have enjoyed having I enjoyed the brevity and variety of these selections as well as the format - topic, cool saint, forgotten prayer, and activity. It made for an easily digestible handbook! I listened on audiobook, and while the narration was good, I think I would've have enjoyed having the paperback alongside so that I could refer to authors, prayers, and other details. A good introduction to the sometimes-weird aspects of Catholicism, both for converts and reverts. Or anyone who wants to dig a little deeper in their faith. Packed with plenty of Catholic inside baseball without making the reader feel unworthy, this book won’t teach you how to be a cool Catholic. Instead, it revels in what’s cool about being Catholic and invites the reader to revel in it too. Tommy Tighe gathered together 15 cool Catholics, many of whom you’ll find speaking and tweeting and writing and hosting Catholic radio shows, to help put this handbook together. Read my full review. This is an excellent collection for Catholics that want to deepen their faith, no mater what their age! The fact that it is written for young people encourages me in the future of our faith. There are things in this book that I am just now beginning to appreciate and I am far past being a twenty something. I just wish I had this book earlier in my life. I highly recommend this to anyone in search of a deeper faith. This was an entertaining, funny and really accessible (which I appreciated, since I myself am not Catholic) read that I found much more relatable than I expected (having grown up in a religious household). I loved hearing from all the different perspectives that people had, and it left me really wanting to read more on Catholic Church history. This was a fun playful book about all things Catholic from confession to the blessed Mother to obscure saints and Catholic baby names. It was a fun read and I loved the format of the chapters - a short reflection on the topic, a relevant obscure saint, a related prayer, and a fun activity. I found this book clever and engaging for both Catholics and those who'd like to learn more about the Catholic faith. I received a complimentary copy of the book to review from the publisher and NetGalley. Lots of food for thought! Easily read in quick bites and lots of suggested actionable ideas. Definitely a book to return to as you implement the different activities into your own life. Some of the humor in the book veered more "dad jokes" than hipster cool, but maybe I'm not enough of a hipster to know what's cool? Overall a nice break from heavy theology tomes. A great and informative read about being Catholic with a sense of humor in the modern world. Learned lots of new prayers, saints, and how to get out of the Catholic rut. Loved it from beginning to end! Pretty much what it claims to be on the cover. A series of “blog post” style essays from a handful of Catholic contributors about what it means to be a faithful Catholic in the world today, with saint biographies, uncommon prayers, and actions to take with each essay. Some really wonderful Catholic insights into living our faith in today’s culture. My favorite part almost without fail were the saints and prayers highlighted at the end of the essays! Great read overall. This is a great book for Catholics looking to roll up their sleeves and dig into the quirkiness of the Catholic faith and history. Think of this more as a textbook, with activities and story to help support your faith. If you want to know all the details about being Catholic, this is the book for you. Having attended Catholic school grades 1-8, I know most of the info in this book, even most of the little known saints. I loved all the prayers that were included. Easy read. Fun to learn more about the faith. Very enjoyable. A book you’ll want to share. An interesting little handbook. I'm not a hipster, though, and I already knew most of the info in the book. I don't think this guy understands what a hipster is. i am rather conflicted about this book. this first section seemed rather cringe-y to me, but the last section was full of really insightful essays.